We humans are unlike any other animal. We have spread to almost all latitudes and ecosystems of the planet, from deserts to jungles. We gather in large societies and live in cities with millions of inhabitants. We have transformed the environment we inhabit, first with agriculture and then with industrialization. No other species on Earth shares these characteristics. A Different Kind of Animal expands on several lectures Boyd delivered at Princeton University in 2016. Using examples and case studies drawn from these lectures, Boyd helps us understand human evolution from a cultural perspective. After detailing his ideas in two introductory chapters, he presents comments and counterarguments from biologist H. Allen Orr, philosopher Kim Sterelny and economist Paul Seabright. 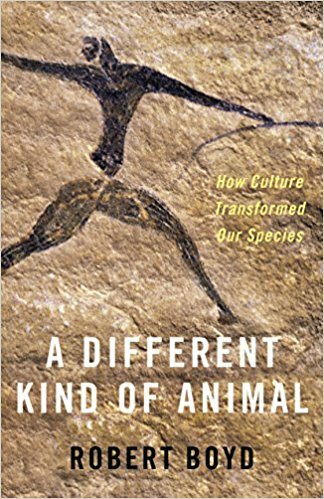 These different perspectives on cultural evolution, together with Boyd’s responses, make for a fascinating (albeit academic) discussion of culture’s role in making humans a dominant species. Our great cognitive abilities are not enough to explain the peculiar success of our species, according to Boyd. “We are not nearly smart enough as individuals to solve the adaptive problems that confronted modern humans,” he writes. As members of a society, we needn’t rely only on our own brains to solve problems: “the fact that we can learn from others means that everybody doesn’t have to invent everything for themselves….” We have access to culture, a repository of knowledge constructed through a cooperative process among individuals over many generations. A member of the Yandruwandha tribe, for example, knows how to survive on the banks of Cooper Creek in Australia, where food is scarce. His cultural inheritance includes methods for detoxifying nardoo plants to produce flour, and ways to build efficient fishing nets. That accumulated knowledge guaranteed the survival of aboriginal Australians, while lack of that knowledge among European colonizers often led to their demise. Boyd argues that cumulative cultural evolution–the gradual accumulation of information over generations–is what allowed early humans to adapt and thrive, and modern societies to build up technological and scientific knowledge. As members of a society, each one of us participates in this process. One of Boyd’s best qualities as an author is his ability to maintain a broad perspective encompassing different fields of study. Dancing from biology to sociology, from anthropology to human ecology, he pushes us along a path of reflection and discovery. The path is not always smooth, however: the technical language and the complexity of the ideas do not make for easy reading. The book demands effort from the reader, but rewards her with provocative arguments that may push her to reconsider her notions of society and human evolution. According to Boyd’s thesis, first proposed with Peter Richerson in 1985, the ability to learn from others (“social learning”) generates a cultural inheritance system with the ability to evolve. This system is tightly correlated with our biology, and co-evolves with genetic traits that are also inherited: “Genetic evolution and cultural change are coupled [in] a process called gene-culture coevolution,” Boyd explains. As a biologist, I find this idea very intriguing. It implies that traits favoring accumulation of culture may have been selected through evolution. The traits include the ability to learn from others and to cooperate even with genetically unrelated people, which Boyd claims were key to our social evolution. I agree. But when Boyd tries to establish the causes and processes that shape this cultural evolution, he enters more problematic and controversial terrain. For Boyd, “high fidelity imitation is required for cultural accumulation.” In other words, we tend to imitate success. We follow fashion trends, we mimic body language and we adopt new slang from our friends. But the picture Boyd paints is incomplete. While claiming that societal values and the opinion of third parties are used to determine who is best to imitate, Boyd also maintains that imitation is blind — that we copy behaviors without really understanding why. I do not deny that this can happen, but for culture to change and evolve, individuals need to acquire completely new behaviors instead of relying on subtle, accidental changes wrought by imperfect imitation. Boyd notes, furthermore, that when people do “make substantial modifications, [it is] only when there is clear evidence that they should.” In my opinion, changes in behavior do not always come as a response to a specific cue. Humans often try new things just out of curiosity. Take farming, for example. The development of agriculture represents a substantial modification in human behavior, allowing us to switch from nomadic to settled life. Domesticating crops like rice and corn was a cumulative effort over several generations. Perhaps the first human discovered how to plant seeds by accident, then repeated the action with better understanding, and it was soon copied by others. At some point, purposeful selection of the best varieties gave rise to the domestication process. This selection may have been driven by intuition — only the biggest seeds, for instance, were chosen for planting the following year–but the dramatic changes to the plants over the course of domestication could hardly have been anticipated by the people who started the process. The varieties of maize we see in the market today do not resemble its wild ancestor, Teosinte, a smaller, more branched plant with very tiny ears. I would argue that agriculture may have begun because of an early human’s curiosity rather than a clear strategy to provide enough food for the tribe. Cultural accumulation requires a balance between imitation and innovation, and natural human curiosity may be one of the driving forces in this process. Though Boyd does not mention it in his book, the evolution of curiosity itself may be favored by genetic traits. Perhaps the most controversial and provocative idea Boyd describes is the process of “cultural group selection,” or the mechanism by which some societal norms persist while others change. As the reader advances into the subject, the language gets more technical and difficult to follow, which is a shame, because this section gives us a glimpse into one of the biggest debates of cultural evolution: whether the theory of natural selection applies to cultural group selection. Boyd claims that natural selection exerts pressure to maintain norms and values that are beneficial for a society, just as it acts on genes to maintain beneficial mutations over harmful ones: “norms causing a group to survive will become more common compared to those that lead to extinction.” This strikes me–a plant geneticist–as a bit of a stretch. How does selection act at the level of social groups? In modern societies, we have many biologically maladaptive behaviors, like unbalanced diets and smoking, with no strong negative selection acting to quash them. Steven Pinker, a psychologist from Harvard and a critic of cultural group selection, claims that genes, individuals, and groups are not equivalent units over which natural selection could act. “This is not how natural selection, analyzed as a mechanistic process, really works,” he notes in “The false allure of group selection” (https://www.edge.org/conversation/steven_pinker-the-false-allure-of-group-selection). As far as we know, natural selection acts only at the level of genes. The danger of applying these principles to cultural group selection, Pinker warns, “is to believe that we should recognize the wisdom behind conservative values like religiosity, patriotism and puritanism” maintained over time and in different societies. In other words, if beneficial norms and values are preserved by natural selection, we might be forced to conclude that any norm that sticks around for many generations is good. But what keeps conservative values alive may not be a positive selection, but rather the rigid social structure that created them. Norms favoring oppression of women, for example, may be enforced by a male-majority government. The danger of applying natural selection in cultural evolution, then, is the oversimplification that idea may convey. From a purely biological point of view, one might argue that any strategy leading to survival of the species is beneficial. And if unequal treatment of women leads to higher birth rates, it must be advantageous. Although I lack all the facts to argue the opposite, I don’t believe that the success of the human species can be measured only in terms of numbers: human quality of life is of great importance, too. Maybe we have advanced so far as a species that our long-term survival may also depend on sustainable and peaceful societies, not just on whether we live long enough to reproduce. Applying natural selection as a mechanism to maintain norms which guarantee survival is especially debatable when society’s “success” cannot simply rely on population numbers. The book ends with three commentaries on Boyd’s lectures by distinguished scholars, followed by his response to each one. The reader catches a captivating glimpse into the process of scientific debate, but may feel sidelined as she watches high-brow arguments fly back and forth. Boyd’s response to his critics often verges on pedantic: “[I] want to explain why I think he’s wrong” and “[he] is also mistaken.” The fact that Boyd stands his ground so rigidly may seem unfair to readers who have maintained an open mind to understand and assimilate the author’s ideas. But after reading A Different Kind of Animal, I indeed feel different. This book changed the way I think about culture and society. Some of Boyd’s ideas resonated with me, revealing the deep cultural connections we humans have. We have access to a cultural inheritance that allows societies to thrive. We are great social learners, and our cooperation surpasses genetic bonds. The points that I disagreed with have also stayed with me. I find myself wondering if my view of society–in which empathy and love promote cooperation better than coercion–is not a bit naïve. Boyd’s ideas, in which humans are blind imitators requiring punishments to behave well, may haunt me for years to come. Marcela H. Coronado is a postdoctoral fellow at NYU, where she works on plant developmental genetics.